Et c'est Bowie en plus! Incroyable!! Great backing vocals on "Heroes"
glad you dig it, Chris! Bojour, Julie et à tous! Très jolie, la pluie, oui? "La nuit noire de l'âme, avec Mlle. Julie"
@P-90: works perfectly :) ! Hahahah la compangnie créole !!! On wfmu ... Love it !!! Pas de "spoilers ", s'il vous plaît! ...Il ya quelques aficionados qui attendent pour toute la saison de "Mad Men" pour arriver sur DVD. Bonjour Julie et Glockabelle et Nuit-peuple! "Les Trublions de la Rébellion"
May 1968: "Boredom is counterrevolutionary." May 1968: "I take my desires for reality because I believe in the reality of my desires." @ Matt: Bonjour! ...was actually just wondering a minute ago when you'd pop up! Great show guys. Smooth sailing for me today. Ooooh, Kate's got nice melismas. Yay Kate! Is this her early 80s limited release EP? Good français, good production. April ! March ! What could be Springier ? Bon to the jour P-90! Yeah this week is a little weird for me but I managed to make the "4:00 am DNOTS Live Guest Deadline"! i gotta make the shirts! des t-shirts pour tout le monde! @Julie: "Kate Bush is an eponymous five-song 12" EP. It was released by EMI in the United States to promote Kate Bush, who was relatively unknown there at that time." So kind of limited - but the Un Baiser D'Enfant / Ne t'enfuis pas tracks were a French and Canadian single before then, so that's the rarer release. @matt @fred vive la révolution! Hey! Just in time for my request! any other fans of Milles Bornes here ? I was just in New Orleans, very good croissants are easy to find there! I don't know if it's because of the French influence or the rich butter filled content, but it's a natural fit! @P-90: Oh man, I didn't even have time to get into that, but my time in university at Radford, VA turned me on to both biscuits n' gravy and GRITS! @FVH: I'm liking this as well! @FVH: It doesn't sound like "Contact", must be a diff song entirely. @FVH: Really? That sure was re-worked from the BB version. Melissa Auf der Maur's French accent strikes me as kinda mangled, does it sound that way to you Glockabelle ? Or is it just everyday goofy Québecois ? Never listened to her sing French! Québec: Quotidien français du gouffé! A new one, this appears not to have made the "dolls" episode! 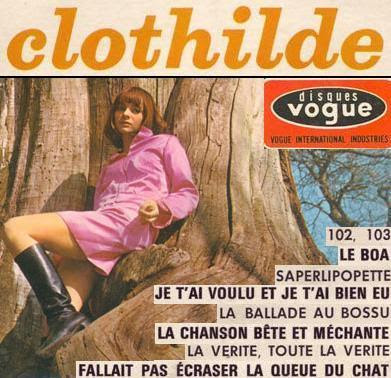 Several French items, what is it with French singers and "poupee"? A distinct lack of diacriticals on the playlist. Where are the chain-smoking grave, the dewy aigu, the rapier-sharp circonflexe, the piercing gaze of the tréma, the shy cedille peeking out from under ? Aerosol! That's a smooth sound effect! "Dr. Von Helsing: Diacritic Psychologist" -- airing 17 hours a day on USA and TNT. "Alouette" is a French trader's song from Quebec. Often it's used in Canadian bilingual French classes to introduce children to the parts of the body in French. @FVH: The other 7 hours can be "DVHDP: Criminal Intent". I wanted to say this for the whole morning and finally I have the chance to sign in in the comment board: THIS SET IS AMAZING! @ matt: I had not heard that Kate Barry had died last year, quelle dommage! @FVH: That's what I've heard about this song. @P-90: Yes, that was sad to hear. I should stop with the caps lock but I'm too passionate for this set. Ah, didn't realize Louis had sung this song--thanks at least for enlightening us to this fact! there should be a WFMU meetup at Montmartre some Sunday with warring ghetto blasters and unlimited quantities of red wine. Then a totally blasted pilgrimage to Bimbo Tower. Where are Pierre and Fred to organise ? When Eurovision songs frequently had foreign translations released. @Fred von helsing I'll pass the message to Pierre he would be very happy to do it, unfortunately I have to tell you that Bimbo Tower has closed and we don't know when it will open again. Glockabelle have you planned to play some Jacqueline Taieb by any chance? Yeah! Aiko Aiko à français! This is another New Orleans area song. And la dame Glockabelle herself! Whoa! Thought I'd left Espace musique on somewhere in the house this am. J'ai adore cela. Thanks, Julie and guest host! Man.... now you are making me definitely feel the need to brush up on my already poor Quebecois French for my trip next month! This is our bonne amie Glockabelle, check out the other Dark Night of the Souls with her as guest! Hi Guido! Thanks for listening everyone, World Goth Day special next week! Salut, Matt. I can smell those Cafe du Monde beignet from herer. Good time in NOLA, I hope. @MvS well then it's Destination Prague ! Salut Sem, Matt, Fred, Alessia and everyone! Tuning in late as always to be greeted by this Wonderful song! Très bien time, Sem! I went to Café du Monde, and tried chicory coffee as well! 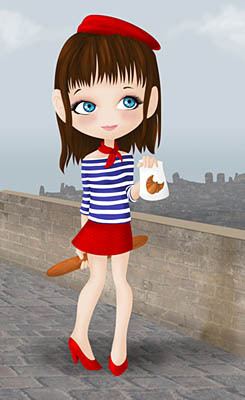 There is another smaller beignet shop, Café Beignet with two branches I rec to visitors! All right, WGD next week! Look forward to it! Merci Julie et Glockabelle! Have a great Thursday, everyone! @Dave B. the old jokes are the best, man. Time to say au revoir. I have to say that chatting with all of you here made this show fantastique!